Cyprus Property Blog by Cleo : Price Reduced - Coral Bay Villa with Deeds - Walk to shops, beach and restaurants! 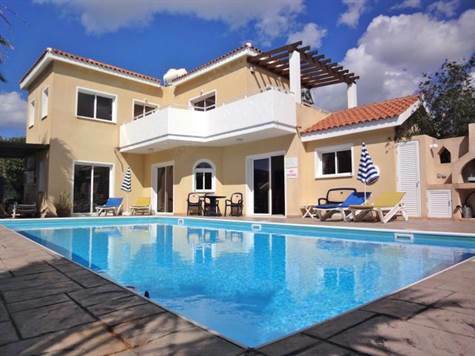 Coral Bay, Paphos - Coral Bay is one of the most popular holiday destinations in the Paphos area, and this impressive detached villa is in an absolute prime location, situated in a quiet cul-de-sac, a few minutes’ walk from the beach, shops and restaurants. The property is well cared for, and has good finishes. There is a spacious open plan living room nicely divided into a comfortable lounge, dining area and end kitchen. Patio doors in the lounge and dining areas provide lots of light, and easy access to the swimming pool terrace. The kitchen includes a breakfast bar, oak cupboards, granite worktops, built-in oven, electric hob/extractor fan, fridge/freezer, dishwasher and washing machine. An archway from the lounge leads to a guest cloakroom, and a double size bedroom with fitted wardrobes, and en-suite shower room. Again patio doors open on to the pool terrace. Upstairs are two large double bedrooms, both with fitted wardrobes and en-suite facilities. Patios door from both rooms lead on to a spacious balcony, which includes a pergola area, and plenty of space for sitting and enjoying the sea views and gorgeous sunsets. There is provision to add a fourth bedroom or study room downstairs, and the access from the lounge is already in place, together with the footings. The plot is on one level, and is nicely laid out with areas of beautifully kept landscaped gardens, a long wide driveway, a large covered pergola area, and the pool terrace with hedges surrounding, and a built-in barbacue at the side. The property is being sold fully furnished and there are full title deeds. It is ideal as either a permanent residence, or as a fabulous holiday home/rental investment.